The Driftwood requires Acrobat® Reader (or a similar program or app) to view and print PDF documents. The reader is free and available for download here. Most users will already have this program or a compatible reader already installed on their computer or mobile device. The Driftwood is now available electronically for immediate download. 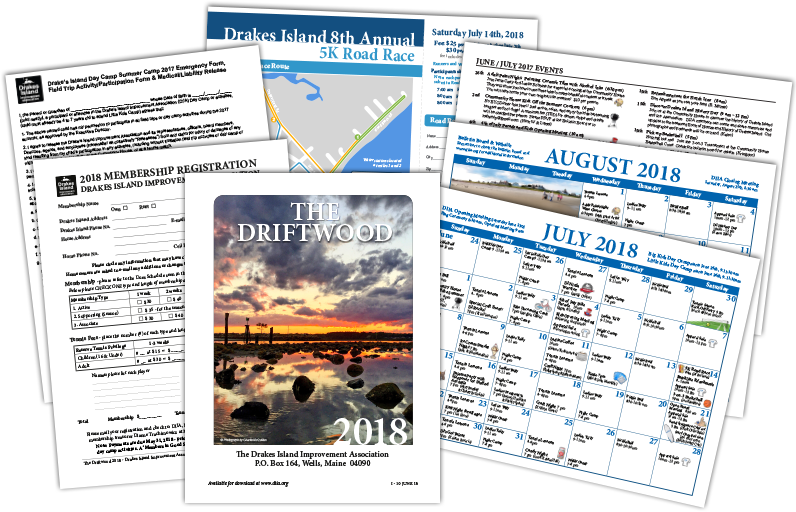 This includes the full version of The Driftwood, along with all the individual forms such as the Drakes Island Membership Registration form and the Drakes Island Day Camp DIIA Summer Camp Emergency Form, Field Trip Activity/ Participation Form & Medical and Liability Release. Abbreviated Edition copies of all forms will be available at the Community House throughout the season while supplies last. Note: These copies do not include all of the pages found on the full edition available for download.